Colchester Continental Fife & Drum Corps will be hosting their 13th annual Muster on the Green, Saturday, July 28th, 2018. 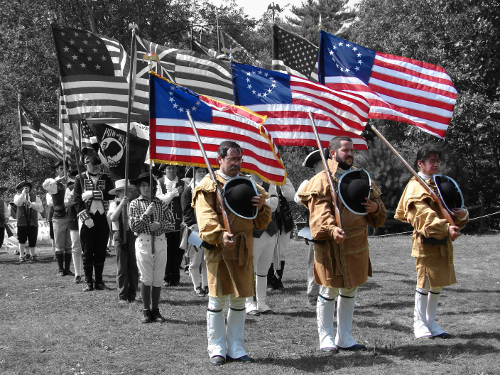 Fife and drum corps from Connecticut and surrounding states will join the Colchester Continentals for an afternoon of martial music. The event will kick off at noon with a short parade on Norwich Ave, beginning at the town hall and ending at the green. Opening ceremonies and the Muster will follow. At a fife & drum muster, each corps marches onto the "muster field," plays a selection of tunes, (usually a 5 minute medley or two) and marches off. When all corps have performed, it is custom for willing members from each corps to amass for "jollification" or the playing of common fife & drum tunes of yesteryear. Bring a lawn chair and enjoy the different corps attending this year's parade and muster. The Colchester Historical Society's annual craft fair will be on the green as well. To add your drum corps to the line up, visit our Contacts page.